For the fourth consecutive season, the Boulder City girls volleyball team began the season on the road in the prestigious Las Vegas Invitational, looking for experience in competitive matches against larger schools. For the fourth consecutive season, the Lady Eagles found themselves struggling and exited the event with a losing record. But for the fourth consecutive season, coach Cherise Hinman’s plan has worked. The Lady Eagles are finding their form in recent weeks, winning league matches and the Boulder City Invitational last weekend. They defeated Rancho, 25-22, 21-25, 15-7, in the championship match Saturday. Jaden Wood had eight kills and Tara Cox had 15 assists, while teammates Alyssa Ybarra had 24 digs and Lauren Pocius had six kills and 13 digs. 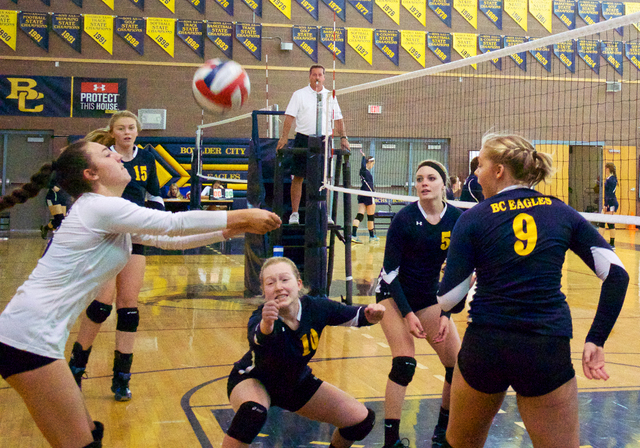 Boulder City is 9-1 in its past 10 matches to raise its overall record to 14-6. The Lady Eagles are 3-0 in the Sunrise League. The Lady Eagles played Tuesday at home against visiting Virgin Valley in a league match. Virgin Valley is the only team to have defeated Boulder City in its previous 10 matches, a nonleague encounter in the Boulder City Invitational last Friday. The Lady Eagles’ next match is Monday at league opponent Sunrise Mountain. The four Lady Eagles — Cox, Pocius, Wood and Ybarra — also played well as Boulder City defeated Lincoln County, 25-21 and 21-15. The Lynx have played in the Division I-A state tournament in two of the past three years. “We were focused because we really wanted to win the tournament on our home court,” senior Ybarra said. “We had support from our teammates and our fans, and we wanted to go all the way to the championship and win it at home. Hinman said that, despite winning the tournament, her team struggled with communication during a few matches. In a league match Sept. 15, Wood had five kills and eight aces to lead the Lady Eagles to a 25-8, 25-15, 25-11 sweep of Desert Pines. Pocius had five kills and five aces, and Cox had 15 assists and nine aces.